Hamburg well known as Germany’s second largest city, but for one week in September 2018 it turned into the wind capital of the world. WindEnergy Hamburg, the world’s largest exhibition for the wind industry, took place in the city from 25 – 28 September 2018 at Hamburg Messe. The event was a truly global affair, attracting 35,000 visitors from more than 100 countries – a 45% increase in international visitors from the previous year. A total of 40 national delegations from the US, Pakistan and Europe, including the UK, attended, as well as energy ministers and other high-level representatives of many nations highlighting the significance of this knowledge-sharing event for the global wind markets. Many of the 1,482 exhibitors from 40 different countries used the exhibition to announce product launches and business transactions. All key players of the entire value chain were present in the fully-booked exhibition halls, including 16 wind turbine manufacturers from Europe, the Americas, and Asia. Partnering with the exhibition was the WindEurope Conference, the world’s largest onshore and offshore conference showcasing opinion, trends and discussions via 500 presentations from leading global experts. Dynamic Markets, Cost Effectiveness, and Smart Energy were all issues topping the agenda at the WindEurope Conference with sessions including: “The next big thing? Saudi Arabia and Russia”, “Perspectives for wind in Africa”, “Offshore wind outside Europe: a look at the US, Taiwan and Japan” as well as “Financing wind in emerging countries”. ‘Experience the whole world of wind energy in 4 days at 1 venue’ was the tagline for this bi-annual event. What makes WindEnergy Hamburg so important? The WindEnergy event annually rotates between Hamburg and Husum, a German town located near the border with Denmark. WindEnergy Hamburg has an international focus, while HUSUM Wind is the meeting point for the German-speaking wind energy market. WindEnergy Hamburg launched in 2014 and quickly became the world’s leading expo for the industry. It is organised jointly by Hamburg Messe und Congress and Messe Husum & Congress. The event’s location, in the heart of Hamburg at Hamburg Messe, is no coincidence. Situated between the North Sea and the Baltic Sea and characterised by excellent wind conditions, the Hamburg Metropolitan Region is an ideal location for onshore and offshore wind turbines. Large international manufacturers such as Areva Wind, Gamesa, General Electric, Nordex, REpower Systems, Siemens and Vestas are located here. While the City of Hamburg has established itself primarily as a location for head offices and research departments, the North and Baltic Sea coasts have become home to various production sites. The Cluster Initiative Energy Hamburg launched in 2011, attracting 150 member companies in its first year. As well as bringing together the diverse skills of the city’s enterprises and research institutions, the initiative promotes collaboration and exchange with other industries. The Cluster supported Hamburg Messe in attracting the expo and conference, facilitating site inspections and sourcing relevant sector stats. 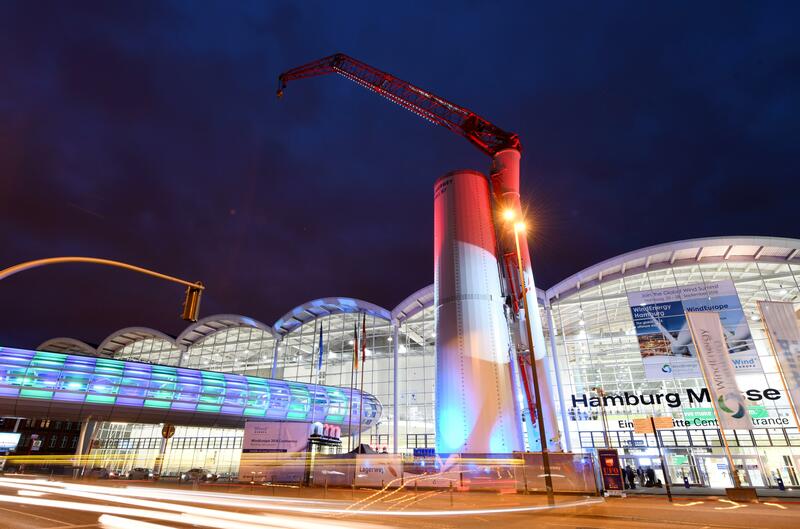 The next WindEnergy Hamburg trade fair will take place 22 to 25 September 2020 at Hamburg Messe. The WindEurope Conference will again be held in parallel. Meeting and event planners can meet the Hamburg Convention Bureau team at ibtm (stand F55), taking place 27 – 29 November in Barcelona.